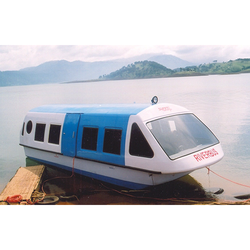 Our organization is offering Ferry Boat to our clients. It is technically good and wide space range and can accommodate at a time 10 person. It is made out of FRP materials, that ensures the flawless product. It is 19 feet and these boats, can be used in various way. We offer these boat at most reasonable rate. To carry 4/6/8 Vehicles & 50-100 passengers, Single ramp conventional Ferry Boat operating in Goa, with Single or Twin Engine Configuration under Inland Vessel Act. 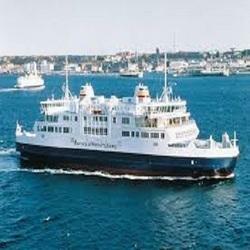 Fast RoPax ferries are conventional ferries with a large garage intake and a relatively large passenger capacity, with conventional diesel propulsion and propellers that sail over 25 knots. tourists travel on griffon hovercraft simply for the experience. Commuters and shoppers use them just like boats. authorities and environmentals like them because they produce virtually no wash. / wake at high speed. Short-sea ferries are arranged so that cargo may be loaded and discharged rapidly. The cargo is mainly loaded commercial vehicles and private cars..
- Length overall : 23.10 mtr. - Length w.L. : 18.37 mtr. - Breadth mld : 5.60 mtr. - Depth : 2.75 mtr.